Activist Vandana Shiva launched a strong and hopeful message during the “Poisons at the Door” conference in Rome on July 10. According to the Indian scientist, 70% of the food consumed worldwide is still grown by small and medium scale farmers. However, she says that industry multinationals selling low quality products that are often contaminated with pesticides are trying to put them out of business. Multinational companies and their poison cartels manipulate the system like puppet masters, while they push for trade agreements like CETA. Thanks to the support of powerful classes and politicians, we risk exhausting the planet’s limited resources, creating impacts on biodiversity and the environment, starkly reducing employment and causing serious health concerns. 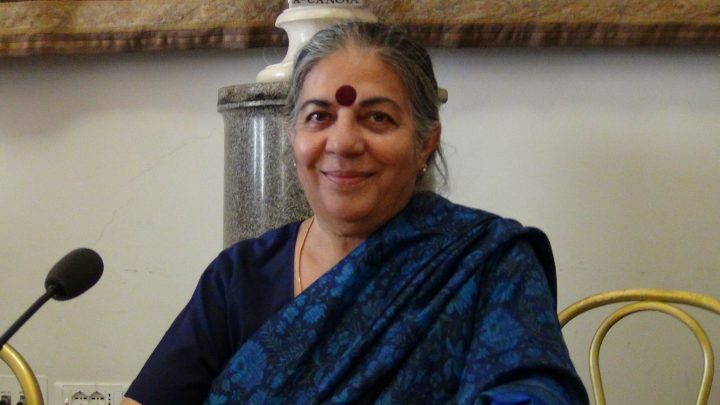 For years now, Vandana Shiva herself has actively been denouncing the neo-liberal model that has created the current gap between 1% of the world population that owns and controls half the wealth of the remaining 99%. The Indian activist points to a “green revolution” as a solution. This would lead to an increase in healthy and sustainable agriculture. This is the only type of agriculture that can both safeguard and respect the planet’s resources, while also guaranteeing survival for farmers. However, the 99% must wake up and raise awareness for this to come to pass. As she told us a few days ago in this video interview: “There is only one humanity and one planet”. No Comments to "Vandana Shiva: “Nonviolence builds a Resilient Spirit”"